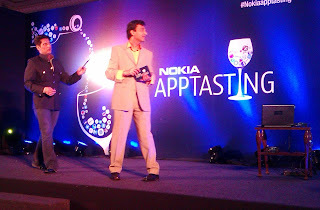 After a wonderful Sunday evening, at the Indiblogger Nokiaaptasting event, I am now back at doing what I am good at – blogging. Now Rajiv Makni and Vikas Khanna, please read my whole blog because you promised to. The post is long just because you had too much offer; I loved them all and want to share every bit of the evening here. Whoever came up with an idea of bringing together Rajiv Makhni and Vikas Khanna together for promoting the dropping market of Nokia really needs a standing applause. The entertainment value of the presentation is good enough to erase those memories of hanging Nokia phones, and come back having a good feeling for the brand in your heart. The event kicked off with the bloggers registering, and sharing their ideas about new great apps that would make a difference. I had heard enough about Rajiv’s wit and Vikas’s good looks from bloggers who attend the previous meet to land a bit early and take seat in the front. I did not want to strain my eyes ogling at the guys from a distance. Anoop started off the event with a weird kind of gesture and hurr hurr cry, which he says was started at the first Indimeet held in Bangalore. Somehow, it worked in shutting down our minds to rest of world and bring us right into the event; to have fun and enjoy it to the fullest. The real happenings of the Nokia event kicked off with Poonam Kaul, Director Communications,Nokia walking on the stage to give a brief account about the brand Nokia and event they were hositng. She explained how they had first organized the Apptasting events for celebrities, success of the Mumbai meet with bloggers .. when with pounding hearts bloggers (especially women) waited for the two stars to walk in. As the two men walked in and took the stage, I knew within seconds that Rajiv is going to bring out the best out of Vikas to entertain us to the fullest. After a brief introduction how food and Apps got together, he began with those hilarious digs at the Vikas, who he says told him he is making Apps for twenty years, LOL. Carrying on with the humorous trait, Vikas won hearts of Indibloggers by fumbling to find the right word for Apps, first he said appliances before finding the right word. That was the beginning and there was no stopping from there. The stage remained vibrant with fun and entertainment all through the night. Vikas Khanna reached right into my heart, when he mentioned how he got to sing bhajan in Udupi Krishna Temple. Here was a master chef who had cooked for President Obama, coming from Amritsar, but talking about a town near my native village and its culture. I was cleanly bowled over when he narrated the Kanakadasa Keertan “Nara janma bandaaga, Naalige iruvaga Krishna enabarade” in impeccable Malanad accent. It made me feel so proud and happy to hear that a celebrity had worked hard to perfect his accent just to get a chance to sing in the temple of Udupi. After being won over for the evening, nothing was going to make me feel bad about the event for the rest of the evening. Not even RajivMakhni looking at me and making up his mind there and then that he is never going to allow me to share the stage with him. Being a smart guy, he had immediately noticed what a show stealer I could be, and decided not to take a back seat. That is how I never got to climb the podium and claim a Nokia lumia. It was all because I made Rajiv Makhni insecure. The event now moved on to make the bloggers happy (at least some of them), by calling three of them at a time over the stage and allowing them to have a shot at fame in 30’s seconds. The smarty Rajiv handed over the tough task of selecting the winners to Vikas, while he, in his immaculate debonair style went on to entertain us, sometimes at the expense of the bloggers. I am sure not even Rajiv was prepared to hear what he had to from Tyger, when he asked him, Why does he blog? The answer was Blog had given him fame and life, 4 girl friends, a wife and he was going to be a father in six months. Nothing could beat that for sure! Here I was feeling happy to have won few goodies on contest, when unknown to me a real great star of blogging world existed. Though we did not get to hear all the bloggers introduce themselves, some of those who did could tell the world what bloggers are all about. It is about people who are trying to make a difference to the world in their own way, about the things they are passionate about. There was the farmer, a senior citizen, 10 year old expressing his feelings and many others among those people who went there and told us why they blog. The introductions made me feel humble as a blogger and proud for being a part of their team. As for the actual Apptasting: we were allowed to taste new Windows App, and all I can say is technically we are moving ahead at lightning speed. From the days of my first 3310 Nokia phone in 2001, we are now having X-ray visions of our surroundings with Nokia City Lens, movie making of 1920’s with Creative Studio, find the right wine and dine with right combination with Cocktail Flow and many more amazing wonderful advantages just in matter of 11 years. Technically speaking I am not a techie, but there is no doubt I love the progress happening in technology and the new gadgets techies churn out from the ocean of science. When I am allowed to taste an app like in the App-Tasting Indiblogger meet, I can lick the plate clean. I was not born as a romantic person who believes in love at first sight, at least not until I touched a keyboard. Unbelievable, but it did happen finally, the fairy tale love at first sight and that too with a computer. I love gadgets and new applications to be added to my mobile, including games, no wonder with his wit and sense of humor Rajiv’s presentation this part of the event the most interesting one to me. 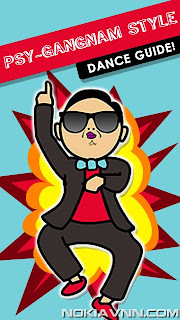 The show steal-er of the event was the Gangnam style dance performed between the cookies and techies. Rajiv even had an app which could train bloggers to dance. To top it all we had a Raj- Simran love story with a great twist presented in his own witty style by Rajiv again. Rajiv like usual had all the drollness and showmanship at full flow, while Vikas entertained by just being himself. He smilingly allowed Rajiv to lure every ounce of adorability out of him most willingly. I wonder why no one swooned with those hot guys on stage and wine to go. There were quite some Lumia’s at stake for cutting onions with a technique taught by Vikas, quiz which included soup tasting to identify the ingredients, and other fun filled events which kept me entertained. Rajiv here came to the rescue of the Vikas when bloggers took advantage of his pleasing and agreeable nature and tried to argue or interfere with him. The tact he used left the bloggers who were subdued, not knowing what actually hit them. He also went on to demonstrate the breath analyzing qualities of our mobile phones. We have to applaud the two volunteers, especially Nabanita, who walked up the stage to take the test. There is no doubt that Rajiv and Vikas were attracting the women folk like light attracts moths, and the girls were willingly becoming gullible to the pranks being pulled on them. We had some more entertainment for bloggers, where they had to shoot three spots selected by Rajiv Makni and present it to him. The best photographer won another Lumia. As a Grand Finale, we had the bloggers who had been chosen by the jury to present their “My wish is your App” ideas. The scene was conducted with Vikas being a judge along with Poonam and five other members (three bloggers included), to whom the bloggers had to present the ideas in 60 seconds. The ideas were great, ranging from snatching phones from kids without making them cry, clicking pictures of products and trying to find the product in shops nearby with discounts, to filling potholes on Bangalore roads. As the event winded up, I wanted to talk to the stars, especially Vikas because I had heard his inspiration story of having trouble walking in earlier days, which had led him to kitchen and later becoming Master Chef and twice winner of Michelin Award. I hesitatingly approached him only to find out he was much better human being than he appeared there on the stage. I mentioned about Farheena’s trouble walking and surgeries she had undergone, when he gracefully walked up to her, sat down beside her and allowed us to photograph him with her, with the same grace he had carried throughout the evening. I am touched! Then it was time for dinner. When walking back after my dinner, I had my chance of revenge on smarty Rajiv who was giving an interview. I walked up to him and interrupted his talk, because there was no way I was walking away from the event without personally talking to him. I told him about my blog, my daughter and introduced him to her as a TV personality. The girl just loves stars and people on TV. I am sure Rajiv was highly impressed by me and was glad that he did not allow me get on the stage and steal the show from him. So with a satisfied smile of having made right decision he went back to his interview, and having my own revenge of making him a bit uncomfortable I walked away. I did not have my camera man (who was enjoying the dinner) to take pictures of him with Farheena. Next time! 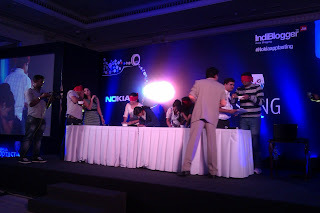 I would not call this Indiblogger Meet, but rather a grand event organized by Nokia exclusively for indibloggers. I met our own Indiblogger team of Renie, Kartik, Vineet, Nandita and other fellow indi-bloggers. Though people were complaining of not having interaction with other bloggers, I found a way because I had will. I connected with many new bloggers, and did not even spare the celebrities nor Nokia team. It all depends on what attitude we show. Kartik made sure we got into the right indiminibus and reached home safely. The sweetheart even called me up next morning to know if everything had gone all right the previous day. Awwww so nice of him. Finally I demand Indiblogger correct my broken relationship with Nokia because they were the ones who sent the other woman(or phone to be precise). Nokia was the first mobile phone I owned in 2002. Back then, even the Nokia 3310 was a treasure.With the advent of Camera phones, I wanted a phone which would allow me to take color photographs. That is when I got my N70. We clicked everything that caught our fancy back then. One fine day, with heavy heart, I gave my up N70 and finally took the N73. Again when my husband brought me an E63, I refused to change because I was used to N73 and comfortable with it. 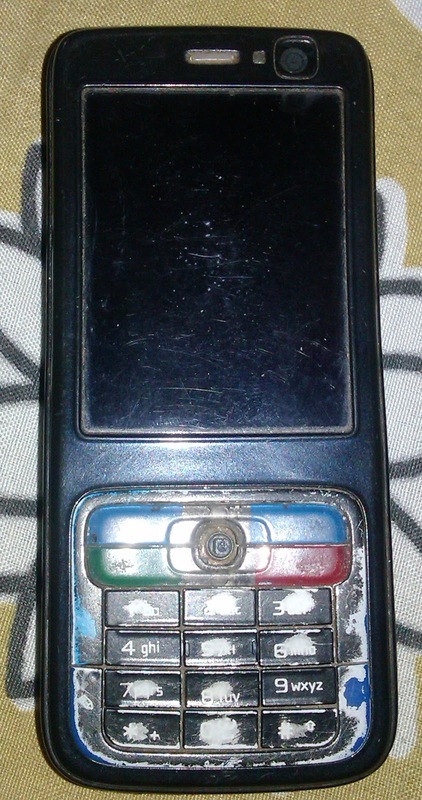 The only problem I had with the phone was, unlike Kasab, it got hanged too often. 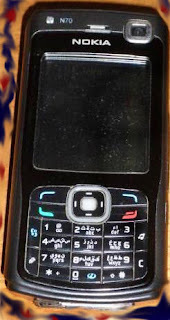 I used the phone for a long time, by changing the panel from silver to black and replacing the keyboard when the buttons wore out until Indiblogger interfered and broke my relationship with Nokia by giving me a HTC wildfire S phone as prize on their contest. 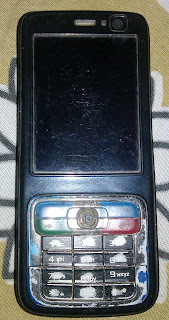 It is now left up to Indiblogger to go ahead the repair my relationship with Nokia by giving me a Nokia Lumia. For those who have great ideas to share with Nokia, the brand has come up with a contest called “Your Wish is My app” which will lead you to fame and money if selected. Thank you Nokia, Indiblogger, Rajiv Makhni and Vikas Khanna for giving us a special Sunday evening to cherish forever. A smiling Farheena means a day well spent. Hope Indiblogger listens to you. I am just kidding Indrani. Blog world and Indibloggers have done enough for me already. Lovely post, Farida! SO great to meet you. We must meet again soon! Sigh. I covet a Lumia too - as a staunch Nokia fan since I owned my first cell phone in 2003! Love the photo of Farheena with Vikas Khanna. Excellent meet experience, Farida. I like your positive approach everywhere. I have heard a lot about these guys and definitely lot of people enjoy such shows. No wonder they are so popular. Some of my friends were disappointed with lack of interaction. But this was expected. Nokia must have paid a bomb to the 2 showmen and you can't have them in the backstage and let bloggers take front stage.I personally have no interest in such programs, cooking or gadgets. That is why I decided to skip the meet the minute I saw the meet agenda. I hinted the same to my friends. But they still chose to attend and ended up feeling disappointed. I saw you comment on Suresh's post. As suggested by you, we will soon ourselves organize an informal blogger's meet purely for blogger interaction. I did the same calculations TF, but I wanted to meet Vikas Khanna for all the different reasons. I had read an article about him where he was unable to walk for 7 years or so. He is a person who has overcome disability and reached great heights. These people give me hope for Farheena, and I wanted her to meet him too. He was such a nice and humble person, who walked over to her, spoke sweetly and when I wanted her to stand beside him for a photograph, he told me not to trouble her but sat down beside her for the picture. After all the cancer awareness programs and seminars, this was really a great break for me, moreover Rayyan and Farheena had lots of fun. BTW looking forward to the informal bloggers meet. It would be just awesome! 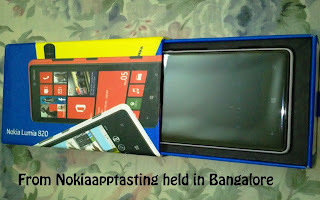 You have described very well about Nokia AppTasting and IndiBlogger meet at ITC Gardenia, Bangalore. We have enjoyed this program nicely and lively. It was indeed pleasure to see you all and want to interact more with you all in next possible meet :). Such well described post about the event :) shows your matured way of enjoying life. Wow Mam, sure will wait for it :) would love to meet you all. Ah, Indiblogger does it well every time and each meet is an event to cherish. I missed the meet this time. Wonder when I will get to do another one. Quite a succinct review of the beautiful evening, Farida. I am enjoying my coming back to Bangalore and having great time here, after ten years of a different life in Byndoor. It was a sea of people and I could not locate you there. What a fabulous evening and loved your account of it :). Hi Farila, Rakhee here, we couldn't talk much in the van as I had to guide the driver to my home which came first, but I really appreciated what little I saw of you. I hope you and your family are doing fine and that you do well in the contest. I saw u there. I had a small talk with Rayyan, but unfortunately couldn't talk to you :(.